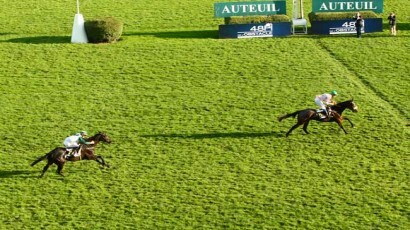 L’hippodrome de AUTEUIL accueille le Quinté du dimanche 08 novembre 2015, le Prix Count Schomberg (R1C5). Cette course d'obstacles, d’une distance de 3 600 m, accueillera 16 chevaux pour une allocation de 105 000 €. Départ à 15h08. 1 Silver Axe H5 2h 1h 5h 2h 6h 6h Th 0h Ts (14) Th 7h 5h BEAUNEZ J. L. BUTEL MME P.
2 News Reel H5 As 2s 3s (14) 7h 3s 1h 4h Ah 6s 3s Ah 1h REGAIRAZ M. FOUIN (S) Y. 3 Viky du Reponet F6 1s 1h 8h 3s 2s 1h (14) 8s Th (13) 3s As PAILLARD S. FOUCHER S.
4 Perly de Clermont H9 0h 3h 4h 4h 2h 4h 5h 3h 2h (14) 5h 6s 5h COTTIN D. SCANDELLA C.
5 Mister Emily H5 6h 1h 6s 2h 2s 7h 5h 5h 2h 6h 2h Ah SCHMIDLIN R. COTTIN (S) FM. 6 Vangel de Cerisy H6 8h 9h As 2s 0h 7h 1s 5h (14) 3h 1h 3h 4h BETRON A. BETRON X. 7 Astre de Ballon H6 7h 1h 1h 3h 6h (14) 1h Th 1p NABET K. PORZIER (S) YM. 8 Verdure Des Obeaux F6 5s 3h (14) 1h 1s (13) Th 3s 2s 0h 5h 4h BEAURAIN T. DEVILDER N.
9 Blouspan H9 5h 1h 8h 4h (13) 8h 1s 3h 4h 1h 7h (12) GELHAY B. BILLOT (S) H.
10 Mukonzi Has H7 1h 4h 2h 2h 8h 8h 0h 0h 3h 5h (14) 3h 4s ACKER ALXI. ROLLAND (S) M.
11 Adagio Des Bordes H5 0h 3h 1h Th 4h 3h 5h (14) 6h Ah 5h 1h 0h MESCAM D. COTTIN (S) FM. 12 Famisco de Codiere H5 1h 5h 5h 7p (14) 7h 2h 6p As 2h 3h 1h 6h JULLIOT R. DUPUIS C.
13 Anemos H8 As Ts 6h 8h 4h 3h 0h 7h 0h 5h 7h 1h GASNIER MR A. LEBLANC P.
14 Tulipe de Ballon F9 0h Ah 4h 7h 0h 7h (14) 0h 3h 8h 1h 4h 7h DE GILES F. RETIF D.
15 Lord Lyphard H8 1h 1h (14) 6h 2h (13) 5h 4h 2h (12) 0h 2 BERTIN R. FERTILLET (S) Y. 16 Mallorca F5 7s 6s 3h 0h 6s 7s 5h 5s (14) 3s 1s 7h 3h NATTIEZ J. LENOGUE P.
Bonne valeur de "Handicap", Verdure des Obeaux (8), vient à bout du n°11 Adagio des Bordes, qui a animé ce "Ze5-Evénement"